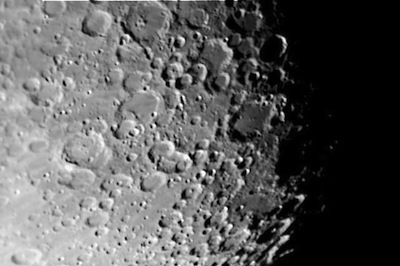 Southern Craters - The southern region of the Moon is rich in craters. This photo shows a part of that region, and the rough terrain is apparent. The craters on the Moon were formed over millions of years by the bombardment of our lone natural satellite with rocks from space. Because the Moon, unlike Earth, has no running water or winds to erode these bumps from its surface, they remain visible there to this day.